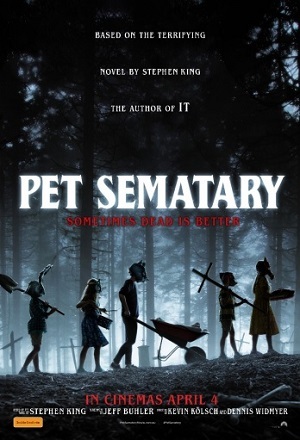 Matt’s Movie Reviews, on behalf of Paramount Pictures Australia, is proud to give you the chance to win a double-pass to see the horror thriller Pet Sematary based on the novel by Stephen King! "Based on the seminal horror novel by Stephen King, Pet Sematary follows Dr. Louis Creed (Jason Clarke), who, after relocating with his wife Rachel (Amy Seimetz) and their two young children frtom Boston to rural Maine, discovers a mysterious burial ground hidden deep in the woods near the family's new home. When tragedy strikes, Louis turns to his unusual neighbour, Jud Crandall (John Lithgow), setting off a perilious chain reaction that unleashes an unfathomable evil with horrific consequences." 1) Write in 25 words: What is your favourite Stephen King movie? Giveaway offer ends Sunday the 31st of March, 2019!!! I have 5 double-passes to giveaway, so be quick and be creative!! 1. Giveaways are only valid to people living in Australia. 2. Matt’s Movie Reviews takes no responsibility for any delay, loss or damage to prizes sent to winners. 3. While all attempts are made to supply prizes at the completion of a giveaway, no responsibility will be held by Matt’s Movie Reviews to supply prizes if for unseen circumstances they are not available. 4. Final decision on giveaway winners is made only by Matt’s Movie Reviews and no correspondence will be entered upon. 5. Winners are only eligible to win prizes if they are in the age/classification group of the film. 6. Only winners will be contacted via email and those who are unsuccessful will not be notified. 7. If you do not provide us with your address information in a timely fashion (within a fortnight of winning), Matt’s Movie Reviews will redistribute your prize to other entrants.